The Chicago Auto Show opened its doors for the first of two media days today, and we joined the ranks of the automotive press to see the car company’s latest wares. As you might expect we headed straight to the Ford booth to see what sort of Mustangs they had on display, and imagine our surprise when we spotted the hood open on a 2015 EcoBoost model. So far Ford has yet to willingly open the hood on any 2015 Mustang’s we’ve seen, so we rushed over to check out the exposed engine. While our photos show the best view yet of the EcoBoost four-cylinder, we have doubts that what you see here is a completely finished product. We imagine there will be a few more refinements on production cars for a cleaner look. For added perspective you can see the EcoBoost engine itself in more detail here. You can check out our photos of the 2015 Ford Mustang’s EcoBoost engine below. 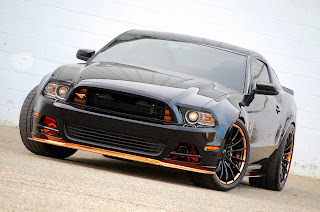 This entry was written by by Drew Phillips (Mustangs Daily) and posted here on Friday, February 7th, 2014 at 8:14 am and is filed under 2015 ford mustang, 2015 ford mustang ecoboost, 2015 mustang, 2015 mustang ecoboost, ecoboost, ecoboost mustang, Photo Galleries. This article was not written by us, rather gathered using RSS feeds listed here. We take no credit for this article. You can leave a response, or trackback from your own site.